It’s the beginning of April in the Ohio Valley. The outside temperatures are warming, and some of our early migrating birds are starting to show up like Pine Warblers, Louisiana Waterthrush, Eastern Phoebes, and the increase of Yellow-rumped Warblers. 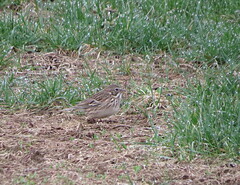 Early April is also the time us birders in southern Ohio start looking for Vesper Sparrows as the pass through to breed further north. Unfortunately for us our window of opportunity is narrow as the proceed further north in the breed. Found in open country feeding mostly along the roadsides and open areas within grasslands, they associate alongside Brewer’s, Savannah, and Lark Sparrow’s. Blending in with their surroundings, they can be tricky to spot, but if you happen to spook one, you’ll notice their familiar white edges on the tail. The classic field mark for this bird. So one of the best places in town to find them is Armleder Park. Located along the Little Miami River, this 305 acre park is a flat, and prone to flooding with great habitat for grassland birds, especially Sparrows. This is the same park that years earlier I was part of a field trip that spooked up a Yellow Rail. Unbelievable! 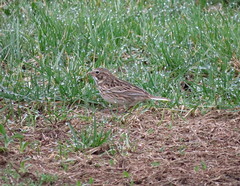 But yesterday it was about Vesper Sparrows, and luck was on my side. Armleder Park this time of year is home to soccer fields galore. I arrived early enough to walk the fields and find the birds as the feed in the dried patches of grass or along the edge of the sidewalks. What’s going on? Birding two days in a row! Maybe I’m feeling better and decided to follow up and do a little chasing of a pair of Long-tailed Ducks that are showing real well at East Fork State Park. But what got my spidey-senses tingling were the rumors of a Western Grebe also being seen. So after working out at the YMCA this morning, I ran home to clean up, then out the door to get to East Fork. Now granted a Western Grebe would be an outstanding bird for this area, however the one I spotted myself back in January of 2016 was the last one that was recorded in this area I believe. Now I could see the confusion when looking at a Horned Grebe in winter plumage, with it’s black cap extending just below the eyes, with loads of white showing on the neck area. I did spot a couple of Horned Grebes as I scanned the area, but no Western Grebes. Just below the dam at East Fork was where I found the male and female Long-tailed Ducks. It’s been a pretty good winter for this species what with more and more reports coming in from all over the state of this beautiful bird. Even though they kept their distance, I was able to snap off a couple of good shots. Caesar Creek State Park can run either hot, or cold for me. I’ve been making regular visits recently with birding really starting to pick up with the arrival of more ducks to the lake. As for the regular gull population, it’s been the normal Ring-bill, Herring, and Bonaparte’s Gulls. That was until 2 days ago when a friend of mine Rick A. (who has a knack for finding rarities) sighted a ABA code 3 Little Gull at Furnas Shores boat ramp. This sighting was later confirmed by several other birders as more and more people drove to Caesar Creek to see for themselves. Little Gull (Larus minutus) are usually reported from the northern part of Ohio along Lake Erie. They’re normally seen with Bonaparte’s Gulls which are slightly larger and very similar. Field markings can be very confusing, especially from a distance if they’re resting on the water. It’s when they’re flying that they really stand out from the Bonaparte’s Gull. They’re underwings are almost blackish in color which really leaps out at you as you observe them in flight. And if they’re flying with Bonaparte’s Gulls you’ll then notice the smaller size difference. Even though this wasn’t a “Life Bird”, I was still anxious when the first report came across Facebook’s “Ohio Chase Birds” page. However with it being the holidays and packages still be delivered, I needed to stay home to make sure “Porch Pirates” didn’t make off with them. Late afternoon yesterday was the only time available for me to chase the bird. By the time I finally got a look at the bird, or should I say 2 Little Gulls, it was about 2:30 pm. We were losing precious light, and with thick cloud cover trying to capture anything flying with such a slow shutter speed was really difficult. As I joined the group of birders, one of them stated that there were 2 of them. Having 1 of these birds is unusual, but 2! Indeed it was 2 as I got on both birds. What a delight. I attempted to take plenty of pictures, however with the terrible lighting conditions, distance from the bird, and slow shutter speed and my auto focus trying to sharpen a moving bird, what pictures I got were mostly for diagnostic purposes. What I like about the above photo is the difference between the Little Gull on the left, and the Bonaparte’s Gulls on the right. Before I get started with this blog entry I thought I’d provide some information that some of you might already know. However there might be birders out there who are new to this great hobby that will find this info helpful. I’m coping and pasting what the American Birding Association defines as their birding codes for each of the 1,002 birds they list. So when you hear another birder referring to a particular bird as a “Code 2”, you’ll have a better understanding. “The ABA Codes are described on the ABA website and the definitions are reproduced here with permission. Please consider purchasing the 7th edition of the ABA Checklist for a more complete discussion of the ABA Birding Codes, as well as much information on rarities in the ABA area. Contact ABA Sales for more information. Code 1 and Code 2: Regularly occurring North American avifauna. Includes regular breeding species and visitors. There is no firm designation between Code 1 and Code 2 species, except that logically Code 1 species are more widespread and are usually more numerous. Code 2 species have a restricted North American range, are more widespread, but occur in lower densities, or are quite secretive making their detection often difficult. We readily acknowledge that some Code 2 species are harder to find than some species that have higher codes. Species that occur in very low numbers, but annually, in the ABA Checklist Area. This includes visitors and rare breeding residents. Species not recorded annually in the ABA Checklist Area, but with six or more total records—including three or more in the past 30 years—reflecting some pattern of occurrence. Species that are recorded five or fewer times in the ABA Checklist Area, or fewer than three records in the past 30 years. Code 6: Cannot be found. It was this last Saturday, November the 3rd, my wife and I were out for the evening when I started checking some of my birding Facebook pages. This has become such a habit now that sometimes I’ll check it even though I just looked at it a minute ago. However this time a posting on “Ohio Chase Birds” Facebook page really got me excited. Someone found out of a sighting of a Spotted Redshank, (Tringa erythropus) near Ann Arbor Michigan. Why does it seem my chases are getting further and further away from home? It was on the 18th of last month I able to chase down the Gray Kingbird in Fairborn Ohio, only to be followed up on the 23rd of the Northern Wheatear near Mansfield Ohio. That drive took a little over 3 hours to reach, and as I read the post I had to really consider at least a 4 hour drive for this once in a life time bird. I thought about it all night and into the next day. Kathy knew I was chomping at the bit, so she told me to just go and have fun. The one condition she put on it was that I spend the night at my daughters house, which is north of Detroit. So while she called our daughter, I hurriedly threw a few things into a suitcase and flew out the door to fill the car. It was 10:30 am and time was of the essence. In all my years of birding I’ve only seen 1 other Code 4 bird, and that was the Garganey at Fernald Preserve in 2011. Since the Redshank was spotted in a very rural part of Michigan I needed some address close by so I could plug it into my GPS. I found a fruit farm just down the road which served my purpose perfectly. After filling up my car and punching in the address, off I went. I made a couple of phone calls to both Phil and Jon to help out with Facebook updates. I knew there would be hundreds of birders converging on this one point, and birders will be updating throughout the day if the bird does of doesn’t stick around. With a drive like this my biggest fear was getting close and it fly off. I settled into the long drive as my mind raced about this bird and what to expect. I’ve seen the crowd lining up along the road with their scopes and cameras all in neat little rows from pictures posted. The police already made their presence known and informed everyone to just make sure you pull completely off the road when you park. Other than that they were very cool about this whole thing. Even the locals would stop and ask what’s going on. And birders really love to explain to folks about anything that has to do with birds. Being Sunday the drive up was uneventful, and my GPS took me directly to the spot. As I approached the area I started to see the line of cars and so I quickly pulled in behind another car. It was during my one pit stop that I pulled on my harness and binoculars and sat my camera next to me. The last thing I wanted to do when I got there was fumble around with this. I grabbed my spotting scope and made my way to the ever expanding crowd of birders. The bird was feeding actively at the intersection of 2 country roads where any amount of rain would fill in the area close to the road. With the light fading and the help of another birder, he was able to put me on the bird. Take a deep breath, wheeeeew! The one defining field marking for this bird are the distinct red legs, and when scanning through all the Greater Yellowlegs, locating a particular bird belly deep in water and then positively identifying it becomes difficult. I’m sorry for the quality of the images, the bird was 80 to 90 yards away and getting clear, crisp shots with my camera proved difficult. These last 2 shots shows the comparison between the Spotted Redshank, with the obvious red legs, and the Greater Yellowleg, with yellow legs. It truly was a remarkable day, and after an hour of hoping the bird would move closer for some better photographs, it was getting time to move along to Detroit. Dinner was at 7, and my daughter is a good cook. On my drive to Detroit I called Jon to give him the news. He told me that I should run over to Ottawa N.W.R. to Krause Road because someone spotted a Hudsonian Godwit earlier. I quickly gave up that idea since it gets dark so early. I’m sure by the time a drive there I wouldn’t be able to see it. However……. Anyone who’s birded this area has heard of Krause Road. It’s a short east/ west road that ends at Ottawa N.W.R. Along the road on both sides is nothing but a few farms and agricultural fields which are noted for flooding after a good rain. It’s a very productive area to bird. I came across the area in question due in fact to the massive flock of Bonaparte’s and Ring-billed gulls. Mixed in with the gulls were a dozen or so Dunlin and a few Greater Yellowlegs, plus the lone Hudsonian Godwit. What a great few days of birding. I can’t wait to do it all over again. I wonder what It’ll be next time? Posted in "On The Road"
“On The Road”, Again for Yet Another Rarity! It’s been only 5 days since I was able to re-locate Ohio’s first recorded Gray Kingbird, when word got out about another rarity. This time it was a Northern Wheatear spotted on a farm in rural Richland County Ohio. I’ve heard of Richland County, but I wasn’t quite sure where it was located. It turns out to be the county that Mansfield Ohio is, which is about 150 miles and a little under 3 hours by car. I Facebook Messaged a friend to see if he was chasing the bird. Initially he wasn’t, however he suggested that I do. I thought for a few minutes and considered the time factor since I was getting a late start. I knew how far Mansfield was, and how long it was going to take to drive, but I didn’t know in what part of the county the bird was in. I was looking at an arrival time of about 4 pm, and not knowing if and when I’ll ever have this opportunity again, I was out the door 10 minutes later. I contacted Phil again to keep me up to date as I drove along, then I settled into the long drive, hoping that the bird would stick around for just a little longer. Dipping on a bird after a long drive like this gives a birder that sinking feeling that’s hard to shake off, especially if you have a 3 hour drive back home. You start questioning yourself, asking if this was the right decision or how could you have done it differently. My friend Chris who changed his mind about chasing the bird let me know he was about 10 minutes behind me and that the bird was again spotted at about 2:20. News like this is always uplifting when doubt often clouds better judgement. I pressed onward with renewed energy. I got to Mansfield without incident, but my timing was off. School was letting out and I had to content with school buses. Then it was the painting crews re-painted the lines on roads which made me detour through a gas station. Then after getting through town I had to be extra mindful of the Amish again. Horse and buggies and cars don’t mix well. I passed the farm up and made a u-turn in a neighbors driveway. The house sat back about 200 yards from the road and you could see the collection of cars accumulating along the gravel drive. I parked and walked up only to find that the bird flew off 20 minutes ago and hasn’t been seen since. However there were plenty of eyes there, and if and when it shows up I’ll be there. I’m not leaving now. I messaged Chris to let him know that the bird was AWOL. He let me know he was there and that he was going to scan along the drive as he worked his way to the house. A few minutes later I step out to look down the drive for Chris when I notice them motioning to the top of a electrical pole. There’s our bird. After a minute it flew down onto the wood pile next to the drive and then proceeded to pose for all the clicking cameras. Mine to. Maybe This Is The “Jolt” I Needed. My Hummingbirds have finally moved on, and the last of the migrating warblers are dwindling as the chill of Autumn envelopes the Ohio Valley with clear blue skies and frost on the grass. 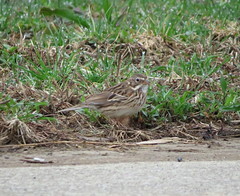 Birding this time of year for me focuses on Sparrows, notably Nelson’s and LeConte’s Sparrows. I find this annual challenge a treat for myself as I venture out to all my favorite spots looking for these skulkers. In years past I’ve had pretty good luck, however this year is proving to be a little more difficult as I change up tactics and plan my next location. Despite the fact that I’m not writing in my blog as often as I would like, I’m still out birding. However even writers get “writers block”, and I think that’s what happened to me. So with that being said I will try my best to keep my blog up to date and fresh. As any birder will tell you the advent of Facebook and owning a smartphone has really opened up “Birding” as a hobby that anyone can enjoy. For myself I’ve pretty much given up on posting anything on Facebook because of personnel reasons that I wrote about in an editorial about a few months back. However it doesn’t keep me belonging to 9 different groups on Facebook related to birds and birding. With more and more folks out in the field birding these pages become inundated with thousands of posts and pictures. You have to sort through everything daily to see if anything good pops up, especially those rarities. For rarities I depend on Ohio Chase Birds, Ohio Rare Bird Alert, and the ABA Rare Bird Alert. Now the beauty of being retired is I’m able to check these 3 sites regularly and with my gear packed I’m ready to sprint out the door at a moments notice. And this is why Facebook and Smartphones have proven themselves valuable for birding in general, but especially for reporting rarities and keeping birders up to date on any recent activity involving rarities. Case in point, lets talk about yesterday. It was late morning yesterday at about 10:30 I had finished a few chores around the house when I picked up my phone to check out the posts on Facebook. At 9:30 a Gray Kingbird was sighted at Leadingham Prairie Preserve near the small town of Medway Ohio, in Clark County. Now I know where Clark County is, however Leadingham Preserve and the town of Medway are new to me. With Clark County being situated northeast of Dayton I knew I had to move fast on this bird. This is a state first record of this species, and a exciting find. So with my heart pounding with this surge of birding adrenalin I threw on some clothes and grabbed my gear and sped out the door. My GPS wasn’t any help with locating Leadingham Preserve, but it was able to find Medway Ohio, and by the looks of the route it was taking me I knew there had to be a faster route. So I called my best friend Phil for some much needed navigational eyes on a computer. He was able to guide me onto the correct Interstates and right to the parking lot of this nondescript preserve that sits close to the Mad River. As I swung my car into the parking lot I couldn’t help but notice the lack of any sign telling the visitor the name of this preserve. However seeing 3 other cars and one with a Birding Ecotours sign on the side convinced me I was in the right spot. I knew one of the birders on location and that he just re-found the bird. But now the trick was finding them. Never having been to this preserve left me at a disadvantage, so I followed a map that was posted on Facebook of the last location outlined in red. By now it’s almost noon and I’m hoping it’s not too late. I wandered around following mowed paths towards the direction of the last sighting. I feel I’m in the right area, but I don’t see anyone. I reach for my phone and Facebook Message Chris, the birder already there to help me find them. After about 5 more minutes and another birder waving his arms towards me, I was finally able to locate the group. However the bird hasn’t been seen for several anxious minutes. The group now totals 5 birders and we decide to move to our left to see if it went back to it’s original location. We had to blaze our own trail as footing became more and more difficult and soggy. We walked 20 feet when I saw the bird fly out into the open over the grassy prairie and away from the tree line, catch something in air, then fly back to the tree line. We quickened our pace. So why is this particular bird so special you ask? Well for one thing it’s a Ohio first for this species, and second is how far it must have traveled or blown off course. And for a bird like this being blown up from down south especially after hurricane Michael is not a far fetched idea. Let’s look at it’s range map. As you can see from the range map, the range of this Gray Kingbird is limited a small portion of the United States with it extending up along the coast of South Carolina on some maps I viewed. I took scores of pictures however I was kind of handicapped with strong winds that really played havoc with the auto-focus on my camera. Just when you think you have a decent photograph, you look at it later and it’s all but a blur. There isn’t enough I can say about how cool this bird is and to be able to experience it with other birders who are just as passionate about birding as I am.